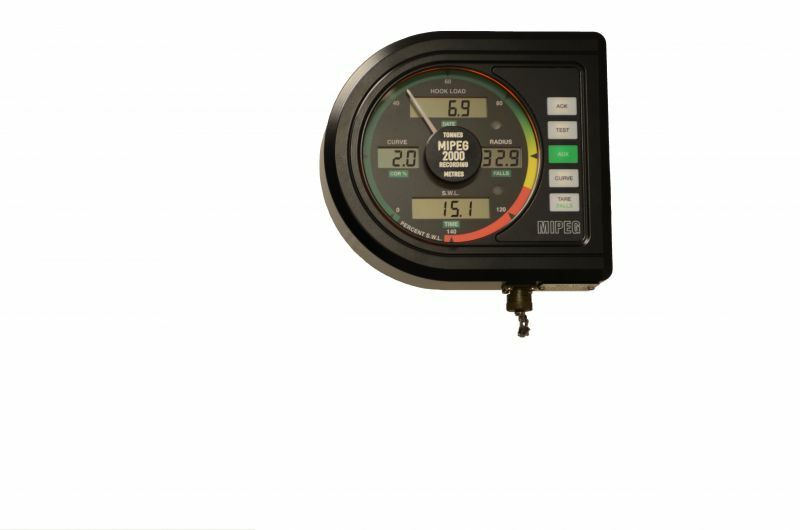 MIPEG 2000 Operator's LCD Display showing actual hook load, hook operating radius, sea state or lifting condition, and Safe Working Load (SWL). When the green "aux" pushbutton is depressed, time & date, falls (parts of line) and cor % are displayed. The LCD's and the display facia are back-lit for night operation. A large analogue needle displayed on top of a green/yellow and red scale is used to achieve a "corner of the eye" indication of the % of SWL. The display is equipped with an amber pre-warning light and a red alarm light together with a system buzzer, to alert the operator. All lights, both for back-lightning or alarm levels are LED's for long service life. The unit is sealed to comply to IP65 (dust tight and water jets). The display can be offered for zone 1 (Class 1 Div 1) operation certified II 2 G EEx ia IIB T4 according to ATEX , Directive 94/9/EC. The outside overall box dimensions are H x W x D; 198 x 224 x 60 (mm), the material is copper free aluminium (weight approx. 3 kg) and the unit is anodised and epoxy coated black. The display is mounted on a L-shaped tube with brackets which allows the display to be tilted in all angles for optimum viewing angle. The display should be mounted in the lower section of the front corner of the crane cab to allow the crane operator to have the display in the corner of the eye, while maintaining full attention to the lifting operation. Note that a connector mounted in the bottom of the display is used for connections to a Lap-Top computer for calibration and fault finding checks. This is optional in a Mipeg 2000 Non-Recording system and will also be the point of retrieving stored crane operation records in a Recording version. This is a standard RS232C connection only used for test and maintenance purposes. The outside overall box dimensions are H x W x D; 100 x 220 x 48 mm ( 4 x 8.7 x 2"), the material is a copper free aluminium (Al 6082) anodised and epoxy coated grey. The weight is approx 1.5 kg / lbs 3.3. The display is designed for indoor mounting typically in a crane cabin or another sheltered area, ingress protected IP 54. The unit is EX-tested and the certificate in accordance with Directive 94/9/EC for use in zone 2 (Class 1 Div 2), II 3 G EEx naL IIC T4. The Mipeg 2000 Safe Load Indicator and Crane Monitoring System has been designed to provide crane operators with the necessary information to meet all known world wide Government requirements for crane safety. The Mipeg X is a modular computer-based system. The main logic controller is the so-called Master 3 card (M3C) containing the microprocessor which executes the on-board software.